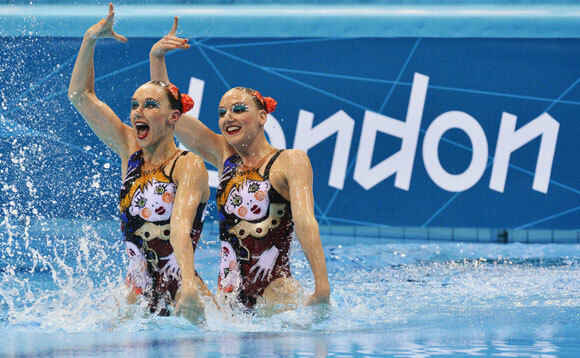 With one gold down, the Russians are trying to discount all the talk about another sweep in synchronised swimming. But it's not working. It's clear everyone else is playing for silver. Natalia Ishchenko and Svetlana Romashina had the crowd cheering before they even entered the pool on Tuesday, extending Russia's monopoly of the sport with a dominating duet win. The team competition begins on Thursday, and the Russians are overwhelming favorites to win in that event, too. "Of course we were under pressure, but we tried not to read the newspapers or listen to the radio," Ishchenko said. "People were trying to hang the gold medals around our necks days before. We just tried our best to focus on what we needed to do." Wearing sparkly suits adorned with cartoonish characters that were supposed to resemble haunted puppets, the Russian pair glided across the deck like ballerinas before collapsing into a split -- and that was just the warm-up for a routine that combined style with athleticism. They finished with 197.100 points, improving on their marks from free preliminaries to easily outdistance the other 11 duos that made it through to the final. The silver went to Spain; China won the bronze. The Russians started with a couple of flips accompanied by dramatic music from the 1970s Italian horror film Suspiria, played to the crowd with the wonderment of children after switching to a bouncier tune from another movie, Amelie, then finished up with a series of furious leg kicks before one last flip set to the soundtrack of the Tim Burton film Sleepy Hollow. They finished with their right arms dangling, like puppets, while a sea of Russian flags waved in the stands. "If we stay in one place or repeat ourselves or rest on our laurels, this would lead to failure, because the other competitors are not sleeping," Russian coach Tatiana Denchenko said. "They are working and want to unseat us." Ishchenko credited a training regime that lasts a total of 10 hours a day in either the pool or the gym. 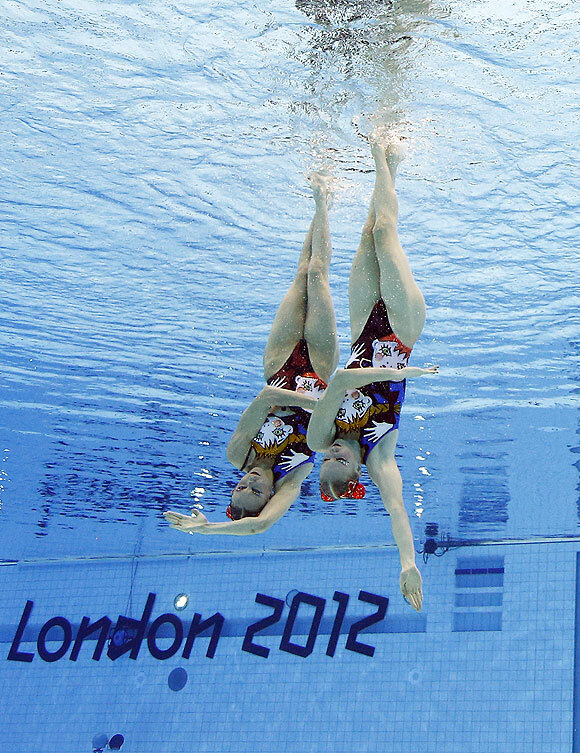 "We don't want to reveal all of our secrets, but standing upside-down in the pool is no joke," she said. Each routine takes a year to prepare. "It starts with choosing the music," Ishchenko said. "Our coach listens to music 24 hours a day -- at home, in the car, wherever -- and then she chooses. Then we prepare the routine and the costumes." Once the Russians were done, the gold medal locked up, Spain's Ona Carbonell and Andrea Fuentes followed with a lively, tango-inspired routine that had the crowd at the Olympic Aquatics Centre clapping along nearly the entire way. They nervously awaited their marks to see whether they had done enough in 3½ minutes to improve on their third-place showing in the prelims. They had, finishing with a score of 192.900 to edge out China for silver. Carbonell and Fuentes weren't sure at first where they had finished, looking toward their coaches with puzzled expressions. "I could not believe it when we realized that we were second," Fuentes said. "I was a bit confused, thinking that the Chinese were ahead of us. We have shown that if we want it, we can get it." Fuentes matched the silver medal she won in duet with Gemma Mengual as her partner at the 2008 Beijing Games. The 22-year-old Carbonell has been her partner for the past 18 months. "Ona is very young and new to the team," said Ana Tarres, the Spanish coach. "All the efforts have paid off." China's Huang Xuechen and Liu Ou settled for the bronze in 192.870. Wearing suits emblazoned with a dragon across the front, Huang and Liu improved on their score from the prelims with an impressive display of legwork, but the duo's heralded stamina — they've been known to train for 10 hours straight — wasn't enough to hold off Spain's elegant maneuvers. Still, it was China's first medal in duet. "We got huge improvement compared to what we got at the previous games, you can see this from the scores," Liu said. "We got everything we could from the training experience." She knows that catching Russia is another matter. "We don't consider Russia a challenger because we cannot compete with them," Liu said. "Our only challenger is Spain."